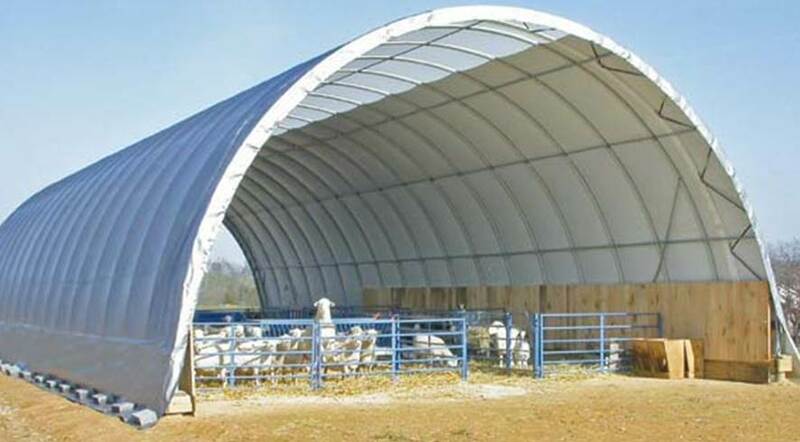 Fabric covered hoop buildings provide the ideal shelter environment for sheep, goats, llamas, and calves. Hoop buildings can be mounted directly on poured walls, wood header walls, and concrete blocks to prevent direct contact with the building structure. The white polyethylene covers allow sheep, goats, and llamas to have the natural lighting which provides for a healthier environment. Hoop shelters are available as fully enclosed (all 4 sides) or with open ends to allow for the proper air flow and ventilation to promote optimal building conditions. Frames consist of structural steel tubing for corrosion resistance and rigidity in all weather conditions. Covers are tensioned tightly to the frame utilizing a rugged ratchet tension system. Each leg features a base plate which allows the building to be fastened to a wall our directly on the ground. All buildings come complete with an easy to understand instruction manual to quick setup and construction. We invite all prospective purchasers to view our large selection of hoop buildings and shelters to provide the ideal shelter environment for their sheep, goats, llamas, and calves.